These two night goblin shamen are the default magic users in my army. They are both level 2, one of them has a dispel scroll. This gives me a pretty good magic attack, and a reasonable magical defence phase, for a low cost. The spells of the Little Waargh are mostly annoying to the enemy rather than game-changing, which is very fitting for goblins when you think about it! In the last game for example, a Vindictive Glare caused 4 wounds on an enemy giant, a Gift of the Spider God gave poisoned attacks to a unit of savage orcs for one turn, Gork Fixed It and cancelled out a couple of chaos warrior attacks, and a Curse of Da Bad Moon killed one chaos warrior. The scroll was used early on to cancel a powerful enemy spell and one of the shamen suffered a wound from a poisoned mushroom. As I said, annoying to the enemy but certainly not game-changing, which is the way I like magic to be. 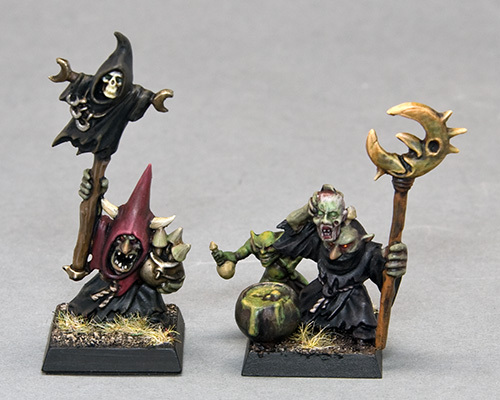 Dribble is the little guy on the left, he's the shamen from the Battle for Skull Pass set and was painted a couple of years ago, I just took the opportunity to add a highlight to his nose. Snivel is made from a few bits (see the details in this post). He uses the head as a conduit for the raw energy of the Little Waargh. And Grubb? 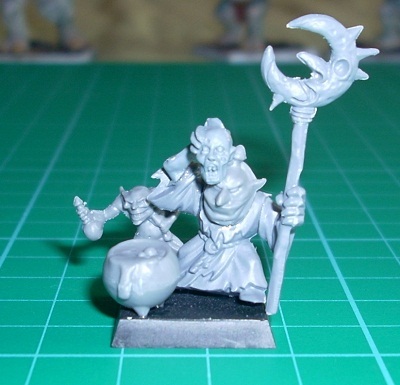 He's the snotling assistant, he fetches mushrooms from the squig caves, tastes the fungus brew and generally gets all the dirty work that shamen are too clever to do. Both are painted with a very simple style to fit in with the rest of the army, only the faces get more than a single highlight. I have also painted a night goblin boss, he was half finished and I thought I might as well apply the finishing touches, even though I don't use a boss in my army. He can become the unit champion in the block of spears for the time being. And that's about all I managed this month, a very poor showing. I blame the weather, it's been uncharacteristically fine and sunny and warm in the UK, so outdoor pursuits have taken precedence over painting. 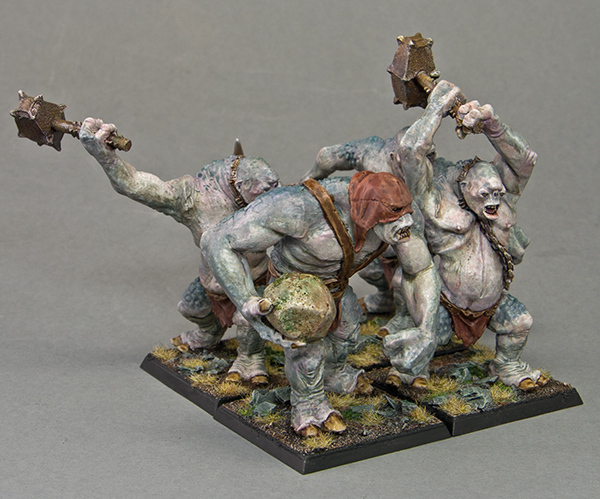 I still have a unit of savage orcs to paint, but am lacking the inspiration to do so at the moment. It was my son who got me involved in Blood Bowl. He plays it over the summer holidays with a group of friends and I watched a couple of games and got interested. A couple of years ago I made a Norse team from some spare plastic marauders, played a couple of games and then put them back in the cabinet. 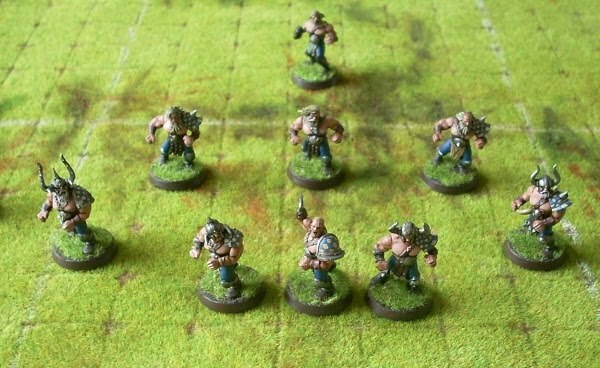 Recently I have played the odd game of Blood Bowl Legendary Edition on the PC, using a Norse team of course. We don't actually own a physical board so if we want to play in the real world (as opposed to the virtual world), we have to borrow a board and all the bits that go with it - the rules are freely available to download on the web. So I put on my Blue Peter thinking cap and got busy. 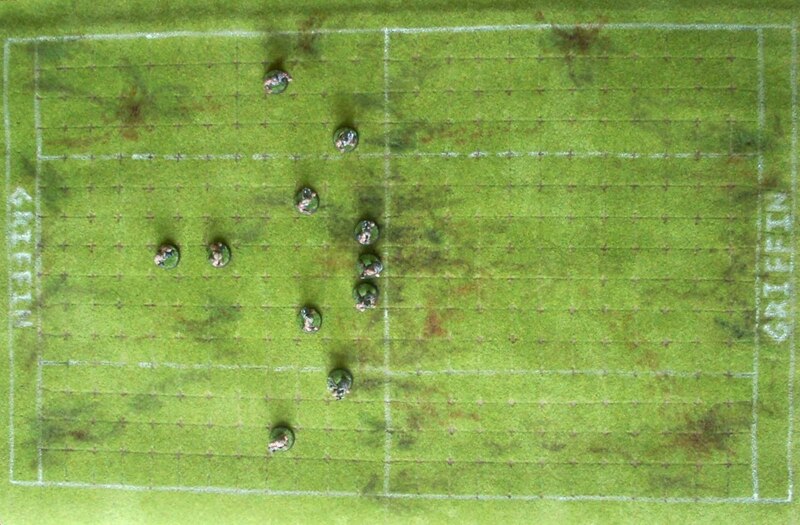 An old grass battle mat, a pair of scissors, a steel rule, a pencil and a couple of hours of measuring, cutting and marking lines with white paint. That's the basic recipe and technique for a homemade pitch, copying the measurements from a real board. I added a couple of touches of my own, blood stains, mud patches and even a message from the game sponsors. All I need now are the blocking dice, a range measure, and plenty of lucky rerolls! Games Workshop have announced a summer expansion for Warhammer called Storm of Magic. Go check it out on their website if you have not already. To summarise, it sounds like Warhammer with supersized magic and monsters. I guess your response to this is broadly one of three. You might be jumping up and down with anticipation, eager to get your hands on another monster or two, or keen to try out some really destructive magic on your mates' armies, salivating at the prospect of cataclysmic mayhem. Or maybe you are hopping mad, ranting on a forum somewhere about dumbing down and pandering to the demands of kids, the lack of balance this will bring/exacerbate, that the emphasis should be on updating the army books. Or maybe you are a bit like me. A pretty boring middle of the road guy, shrugging at the latest attempt by GW to raise a bit of money with a Hollywood style blockbuster. Just like the typical big budget summer action movie, it will be all spectacle but little substance. And just like the latest action movie, you may well see it, be impressed by the special effects, laugh at the plot and dialogue, enjoy it for a couple of hours and then forget it about. It brings to mind the previous big expansion for Warhammer, the Storm of Chaos. A book containing several new army lists, a massive online campaign and a raft of new minis to support the project. Some players built armies and took them to tournaments, and for a while it was absorbed into the mainstream. Eventually, the campaign ended, the army lists were dropped and were no longer considered official, some players were left with unplayable collections. However, I am a glass-half-full kind of guy, so I will say that I am cautiously looking forward to the new models. 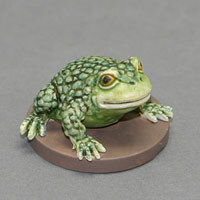 It's always good to see new minis, that's what makes us hobbyists tick, so hopefully there will be something in among the new releases to please everyone. I say cautiously because the latest releases have not really been to my tastes (giant robots, surfing skeletons and dancing snakes just don't do it for me). The terrain I am guessing will be magic effects, craters, shattered buildings, chasms, whatever. Okay for the occasional game but not something I would expect to see on a permanent basis. Hopefully there will be some new wizards in there, not just to fill the gaps in the Empire range but perhaps for other races too. But I can't help thinking back to the Albion campaign, when armies could employ mercenary wizards and it all got a bit silly. If it turns out that dwarfs have access to magic over the summer, that's it, I am throwing my popcorn on the floor, and storming out, as it were. I can wait a few months, the storm clouds will blow away and Warhammer will get back to normal. I have now played 3 games with the new orc and goblin army book. It's very early days, but I am learning as I go along. I am using most of the models I have painted as a core of my army, with a few additions each game to try new units or adapt from the previous game. In a 2500 point army I typically have an orc warboss on boar with an Ogre Blade, a Charmed Shield and a Talisman of Preservation. This guy is an absolute beast in combat and so far has not even suffered a scratch, even though he has no real defence against shooting and magic (apart from driving the stone trolls before him as a shield). He has destroyed chaos knights, minotaurs, Empire greatswords and halberdiers. The obligatory black orc army standard has the Enchanted Shield and Talisman of Endurance and usually leads a mob of 25 orcs with extra choppas. If I am honest he has not really achieved much in combat, but that's not his primary role. For magical support I am still testing the water, but two level 2 night goblin shaman have given reasonable results at low cost. The Waaargh spells have not been spectacular, though a Curse of Da Bad Moon did take out about 30 Empire troops in the last game. My main fighting troops are the 25 orcs mentioned above, 20 black orcs and 24 savage orc biguns, the latter two don't seem to need characters to boost them. Support troops are 30 night goblins with spears and nets and one or two fanatics, another unit of 20 night goblins with bows and a couple of fanatics, and a squig herd of between 10 and 20 models. I usually take 3 units of fast cavalry (2 wolf rider, 1 spider rider). Other units available to me are 4 stone trolls, 3 trolls, 2 spear chukkas and an orc chariot. 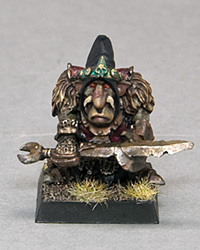 I also have a couple of orc shamen painted I could use. This is pretty much all that I have assembled and painted (for the most part). The army seems to be reasonably well equipped in combat. The black orcs and savage orcs are highly destructive against most enemy. 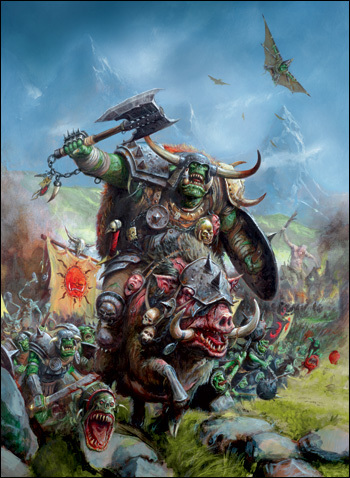 The orc boyz are fairly average but do well supported by characters and/or chariots. The night goblin spears have surprised me, doing well against average troops like Empire halberdiers but also standing up well to more scary foes like minotaurs. I am planning on making this unit 40 strong. 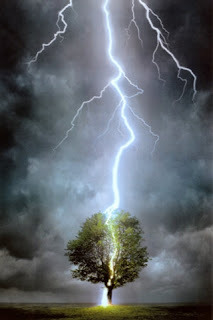 It's in the support areas that I am likely to make most changes. The squigs and fanatics do as much damage to my army as they do to the enemy, so I really have to learn how to cope with that. Squig herds and manglers on paper look a no-brainer, but once they have gone wild they can (and do) cause as much damage to friends as they do to foes. The obvious thing to do is keep them on the flanks and push them forward as fast as possible, out of harm's way, but that can be easier said than done. The game that caused me most problems was against Empire, greenskins and black powder are not a good combination. I need something to cause a long range threat from turn one. The magic decks are quite short range really (and magic is too fickle to base strategy on), so artillery is an area I am currently investigating. Spear chukkas are unreliable and cause relatively little damage, so I am going to try out a rock lobba and a doom diver in future games. I am also aware that wolf chariots have a very long reach and could easily charge on turn 2, which might be useful against pesky Empire shooty detachments, elven archers, etc. So that's a brief overview of the story so far, still a long way to go with many more enemies to fight, but I am enjoying the new army and finding the book to be pretty well balanced and in character. For a casual gamer like myself, it's a good book. My most amusing moment of the battles to date was a charge by a lone troll into a unit of 10 Empire knights, hoping to maybe stall them for a turn or two. The knights failed their fear test, missed all their attacks, the troll vomited over the captain, won the combat by one, the knights fled off the board. A classic against the odds moment! It's big, it's scary and it's got eight legs! It's a unit of four trolls of course. What else could it be? This is the first addition to the orcs and goblins army in my Spring Challenge - I am dedicating March, April and May to painting greenskins. Okay, so these are not green, but you get my gist. I will probably field these as stone trolls, hoping that the scaly skin will give them a little more durability against their favourite targets of knights (they do like a bit of roasted horse). The magic resistance is handy too when facing magic missiles, I can screen more vulnerable troops behind them. Just hoping that they don't become too stupid too often. 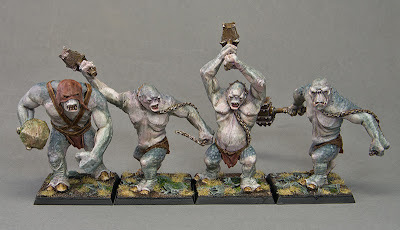 I chose the LOTR models because I really dislike the official metal stone trolls. These are big and impressive models and add interest to the masses of green and black that my army is (orcs and night goblins). I also thought I would be able to use them in my chaos army, and these fit the bill more to my mind. 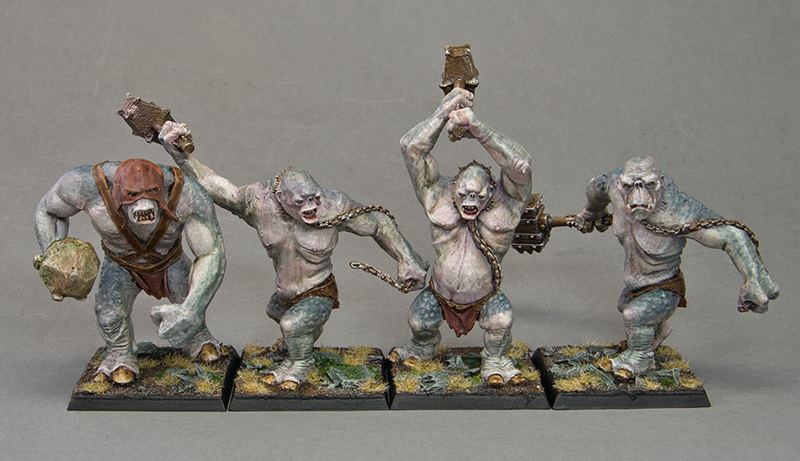 It took me a while to find them cheap enough on ebay, trolls have become fairly popular in the past few months. I painted them by stippling on the colours over a light undercoat. Glazes and washes have done most of the hard work, just a tiny bit of highlighting here and there. This kind of technique works well on organic subjects like these. It's nice to be able to cross off a unit from my to do list. Just have to get them through their first game as a freshly painted unit (I fully expect the curse of the newly painted to strike them down). So just in case they get completely obliterated, here's another picture.